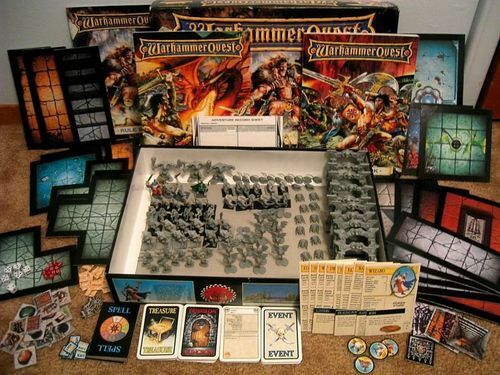 Contents of the Warhammer Quest boxed game – so many miniatures! flagship Warhammer universe. 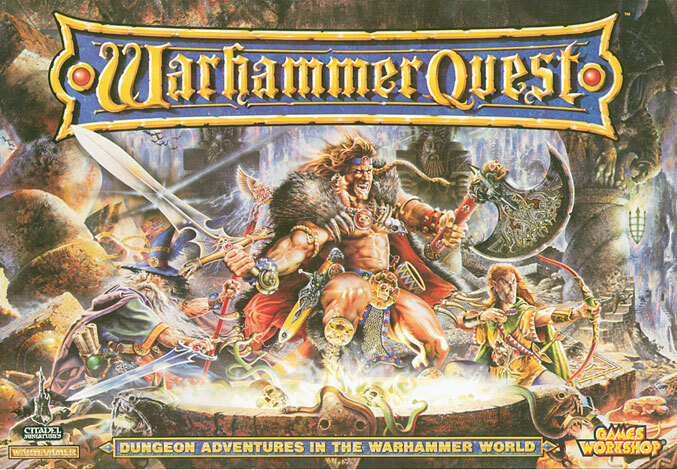 In Warhammer Quest, the players take control of one of four brave Warriors (either a Barbarian, Dwarf, Elf or Wizard) ready to plunder the Dungeons beneath the Warhammer world, searching for riches, treasure and glory! In Warhammer Quest, the Warriors fight across a modular system of board sections or tiles generated using a deck of special playing cards (the ‘Dungeon Deck’), and do battle with evil monsters represented by using Citadel Miniatures produced by Games Workshop. Unusually for a board game, the players must cooperate to make it out of the Dungeon alive. Success is measured by the amount of gold and treasure you accrue in your Adventures/Quests, and strangely seems to lead to intense competition between the players! Monsters, encounters and traps are generated using another set of cards (the ‘Event Deck’), and the success of dealing with these is determined using regular six-sided (‘D6′). The use of the card system and dice mean that an enjoyable, random game can be played by around four players without the need for a Games Master. The use of cards here in particular speeds up the basic game so that players don’t have to keep halting play to roll on tables, something that can spoil traditional pen & paper RPGs. One of the best things about playing Warhammer Quest is that it offers an optional, more involved set of rules. Using these rules, the Warriors are kept from game to game, accruing extra gold, equipment and treasure as they slaughter their way through a greater variety of perpetually more challenging Monsters. Between games, Warriors can brave the Travelling Hazards to visit Settlements where they can visit Special Locations and Traders to purchase extra equipment. To keep things interesting ‘out of the Dungeon’ a system of random Settlement Events is used to see what happens to the Warriors. Hopefully the Warriors don’t get too badly mugged or killed in a duel! Warriors can also train in Settlements, earning characteristic increases and extra skills and the ability to face even tougher monsters! A player could use one of these Warrior Packs by simply substituting that Warrior for one of the basic ones in the main game. 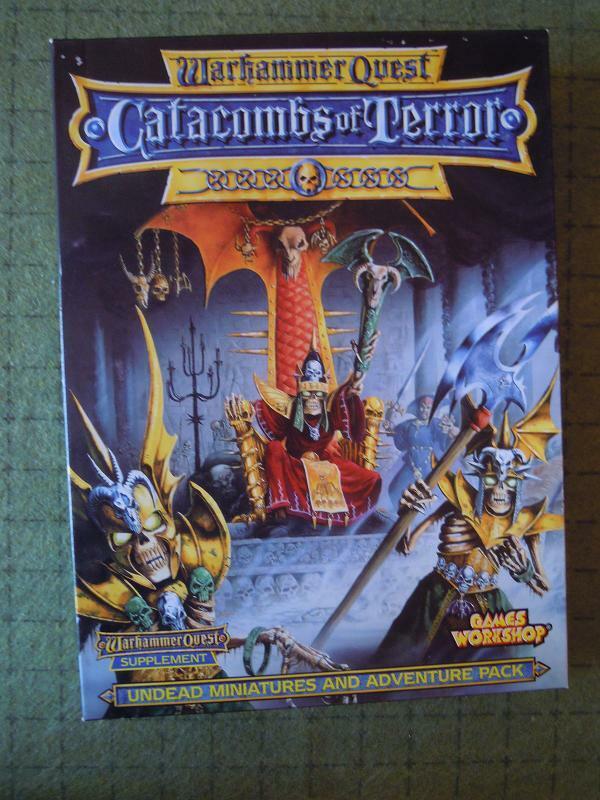 The Warrior Packs consisted of a miniature for that Warrior and all of the tokens, equipment and summary cards for using that Warrior in the basic game of Warhammer Quest. They also contained a rules booklet explaining how to use that type of Warrior in Advanced games, including rules for visiting settlements and training to higher Battle Levels. As a rule, the Warrior packs produced characters that were more powerful than the basic four that were provided in the main Warhammer Quest boxed set. For a full list, see the Warhammer Quest Index. This site contains a lot of useful extras to enhance your games of Warhammer Quest, from new Warriors and Monsters to Travelling Hazards and Dungeon Events. Head over to the Warhammer Quest Rules section to find out more. Also, you will find ‘the best of the rest’ in the Warhammer Quest Links section. The Links page contains the best Warhammer Quest websites and tools that I have found so far, let me know if you find other good resources and I’ll happily add a link to them from the Vault! Perhaps of particular note are the Warhammer Quest 2007 Yahoo Group, the War Seer Warhammer Quest Forum and the Warhammer Quest Runboard Forum. All of these are still active (particularly the forums) and are good places to discuss anything Warhammer Quest related, including rules questions and so on. First and foremost, check out the section for vendors that sell board sections designed for other game systems. These can be either in printed or downloadable format. Also keep your eye out for sites containing free downloadable board sections and even some commercial or “freeware” tools to create your own board sections and maps. Hitting your favourite search engine for Board Sections, Hero Quest tiles, D&D tiles etc can lead to sites that offer free board sections for download. These can be downloaded, resized and printed for use in Warhammer Quest. 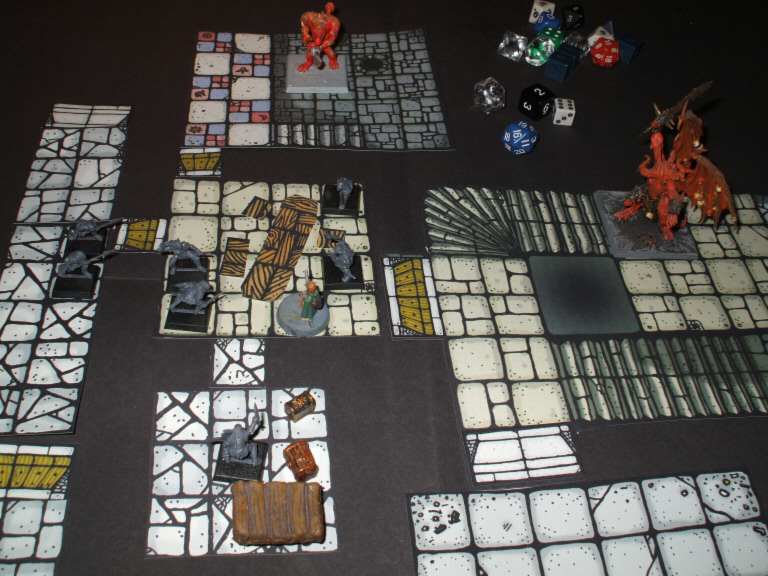 tiles for Role Play Games. One such company is World Works, who produce a range of paid-for PDF files for download. These come in an enormous variety of styles that can even be used to build a 3D board! You can also download furniture and other objects for your games. For those with some cash and lots of time to burn, try Hirst Arts Moulds. These plaster moulds can be used to create some fantastic looking board sections! 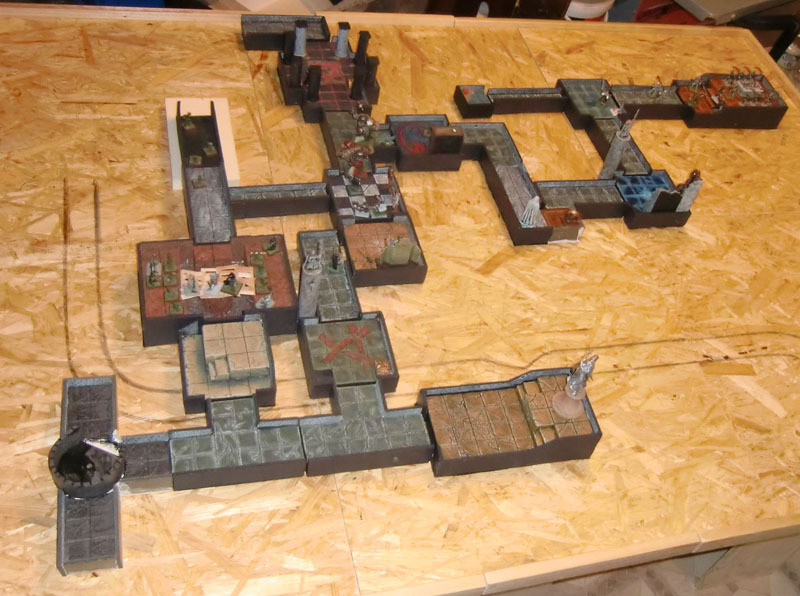 Searching for “Warhammer Quest 3D dungeon” in your favourite search engine will reveal some stunning examples of Warhammer Quest boards made by enthusiastic modellers.